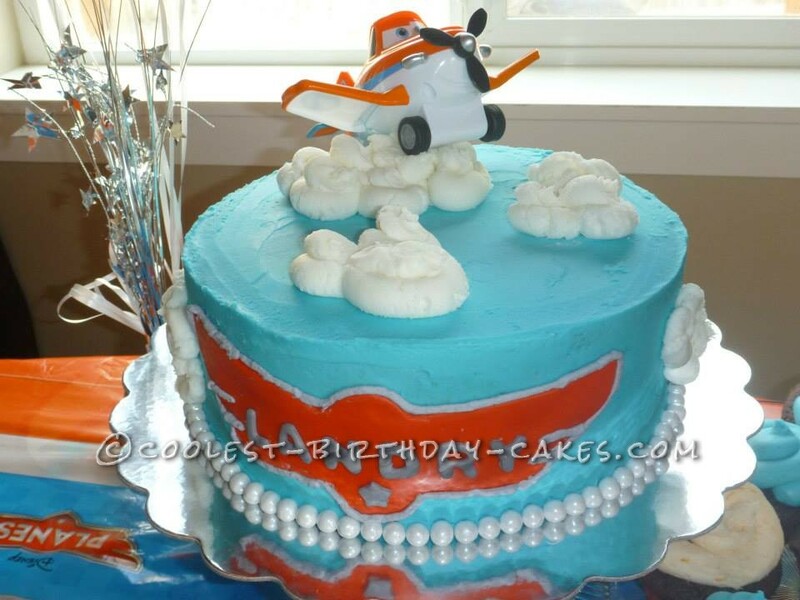 We went with a Disney Planes theme for my son’s 2nd birthday. It was a blast. This 10” round cake was the yummiest vanilla cake I had ever made! Recipe in comments section below. It was dense but very moist and I received lots of complements. To go with the color scheme of Planes I chose an orange butter cream filling that included cream cheese and orange zest—so. darn. Good (don’t tell my hubby but I actually licked the bowl!). Because I am a busy, working mom I always bake my cakes the weekend before the party and place in the freezer wrapped in two layers of saran wrap. This not only saves me time, but makes them easier to ice. I made the Planes logo with his name two days before the party from red fondant and placed in the fridge. I couldn’t see paying the price for a small package of pre-made red since I had marshmallows and confectioner sugar in the pantry. Therefore, I picked up the Wilton Red gel coloring for $ 1.75 and made a very small batch myself. I printed out the logo and traced with a small pizza cutter. I used black gel to get a gray marble to use for his name with the small Wilton letter cutters. The night before the party I iced and decorated the cake. This was my first attempt at icing a cake. I usually always cover in fondant because I find it easier, but my family has informed me they don’t like eating fondant! It was a struggle, and not perfect but since it was supposed to be a sky I thought I could get away with imperfections. I used gray royal icing to adhere the Planes logo and to outline it has well. Boy, did I get a lesson in dealing with black gel—my first batch was purple! A little black goes a looooooong way! I piped the clouds by using a large round Atez tip. My buttercream was a little thick so it made it difficult to pipe, but in a way also made the clouds more authentic. The white pearls are “sixlets” candies that I found in the cake decorating aisle at Walmart for $1/pack. (Note: one pack should go around the bottom of an 8” round perfectly.) The plane toy on top was part of a remote control plane set that he was getting as a birthday gift—worked perfectly! Here is the recipe for this yummy vanilla cake: http://www.bhg.com/recipe/layer-cakes/classic-vanilla-cake/?socsrc=bhgpin042612vanillacakehandmadecharlottepi. Here is the recipe for this yummy vanilla cake: http://www.bhg.com/recipe/laye….